It happens from time to time that I am asked questions about using a wood burning cook stove. I wanted to answer the most often asked questions here. Maybe this will help others also. For me, cooking on a wood stove is not much different than cooking over a campfire. The premise is the same. Only difference is that food cooks faster on the stove, in my opinion. 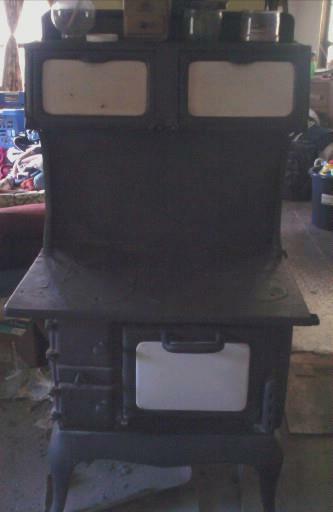 Here is a picture of our wood stove. Each year, as soon as the temps are cool enough that I won’t be heating us out of the house, I start using this stove instead of the gas stove. This serves 2 purposes: saves on propane expense and it also heats the home. Here is a picture of our wood stove. The first thing to consider in cooking on a wood stove is the wood being used. Soft woods, such as pine, will burn faster and put out far less heat than a hardwood. Soft wood also will cause creosote to build up faster. A hardwood will burn hotter and longer. This is what I prefer for most cooking and heating needs. In our area, pecan trees are a favorite of mine for cooking with. The wood is hard and burn very hot. I am able to cook a meal using less wood, which also saves us the extra work of cutting & splitting the extra amounts of wood. The cookware that I use most, on both the gas and wood stoves, are the cast iron skillets and griddle. I prefer them over any other type. I also found a couple of years ago some old, thick walled sauce pans and dutch oven at an elderly woman’s garage sale. She was unable to lift these much heavier pans. In talking with her, I learned that she had these for nearly 40 years. For wood stove cooking, these heavy pans are perfect! Metal trivets of varying heights are great to have for regulating heat. If I am needing a higher heat, I place the cookware directly on the stove. Trivets are used to raise cookware off of the stove surface when a lower “heat setting” is needed. I also control the heat of the stove by how full I stock it with the wood and the type of wood used. During the cold months, when the wood stove is constantly in use, place an old tea kettle or camp-style coffee pot filled with water on the stove. The steam will prevent the air from drying out too much. I keep an old stock pot of water on the stove. This not only puts moisture back into the air, but I have a continuous supply of hot water available for cleaning, cooking, or a cup of tea. Another old-time method of putting moisture back into the air is to place a stockpot of soup or stew placed on a trivet at the back of the stove. The stock pot is out of the way for tending the fire, yet will simmer all day. I start the soup or stew in the morning. It is like having a slow cooker. For stews, I will cook the meat first, then assemble the stew in the stock pot or dutch oven. Once assembled, I place it on a low trivet to simmer all day. If I ever notice that the stew or soup is boiling, I simply place a slightly taller trivet under it in place of the lower one. Some days, I am trading out trivets several times. It all depends on the wood being used. Cooking on a wood stove takes practice. It is actually no different than changing from an electric stove to gas. You have to adjust your cooking slightly to the new heat source. The only difference is the issue of having to restock the wood from time to time. I have been thinking a lot lately about the topic of child rearing. I am raising little ones for the second time around. My oldest children being grown and in some cases have families of their own now. In my mid-40’s I was surprised and blessed with 2 more children. They will be ages 5 and 7 this spring. I am finding that raising little ones at my current age is very different than with my older children. Yes, there are some similarities, but I find that I have much more patience. I am also more set in my own life. I have a firmer foundation to build upon than I did in my 20’s. One issue that has changed is that my husband and I are taking a Biblical approach to raising our 2 young ones. Have you noticed that in general, parents are raising their children in a politically correct fashion? Many are more concerned with their child’s ego than with teaching them right from wrong. They are more concerned with making everything fair than teaching their children that sometimes, life can be seemingly unfair. They are afraid to discipline their children, worried that their child will hate them for it. They also have worry about what others might think if, heaven forbid, that actually punish their child for a wrong doing. What do these same parents think will happen if their child gets into trouble away from home? If they damage someone’s property, do they expect the property owner to be as soft in response as they are? In raising children Biblically, you are not teaching them through discipline, as many would think. Instead, you are training them to behave properly. Just as you would teach a child not to touch a hot stove, you can train them to obey. Many parents mistakenly think that they are training their child to do good if they are disciplining them when they do wrong. While you ARE teaching that there is a consequence to that behavior, you are not training them into doing good behavior. Training means working with your child. Even practicing situations that they have difficulty with. From the beginning, you establish boundaries and enforce them. For example, if your child is old enough to take a book off of their bookshelf, they are old enough to put it back properly. You show them how the first time or two. Then, you supervise them after. If they do not put a book away properly, you have them fix it. Some modern thinking parents may wonder why you would want to fuss over something so minor. Okay, at what point in the bookshelf becoming messy do you find it appropriate to have the child clean it? If you wait too long, they end up having to remove all books to replace them neatly. On the other hand, if you address it right away with that first book that is not properly shelved, they only have to fix one book. The training has to take place in all areas of the child’s life. Teaching them to do chores without grumbling or fuss, keeping their rooms neat, giving proper attention to their studies, and learning to obey without feeling the need to negotiate are all important lessons. One that usually has people squirming is the idea of teaching children to obey without question. They mistakenly believe that you are expecting blind obedience. Well, in a sense we may be doing just that. Too many kids seem to feel that all boundaries, chores, or other responsibilities are up for negotiation. Sorry, to inform the uninformed, but you are a parent, not their best friend. They have peers to be friends with. What they need most from their parents is the instruction and guidance to help them to become the best person that they can be. If you are not teaching values to your child, then who is? One thing that I have noticed is that the families who truly train their children instead of only disciplining them, end up having a much easier time raising their children. They also have much happier family life. Unfortunately, most parents seem to take the easier route and let society raise their kids for them. Being a homeschooling Momma, I am in te throes of education on a daily basis. Whether itbe oranized lessons that the children’s curriculum has laid out or the simple, quiet teaching moments that arise throughout the day, the children are being taught. I started thinking about hw parents should always strive to set the example for their children. If we, as parents, truly see education as being something valued and worth pursuit, whatare we doing to actively show this to our chlidren? I am a bit on the strange side. I have always been the most content when I am actively studying or researching something. At those times, I am in my element. If I go too long without reading or researching a topic, then I begin to fee out of sorts. My focus in daily tasks becomes diminished and I just struggle to cope. It gets so bad at times that I can honestly say that I understand my autistic son more becaue of it. I was never very social in school. I tolerated having to deal with others so that I could focus on the classes. For fun, one summer I had bought a used Calculus and a book on trigonometry. I studied both over the next several months. I related to books and research far better than people. I find that I am still this way. Now though, it serves a deeper purpose. As I am teaching the children, they are also seeing that I am suying too. Today, for example, our daughter was working at her desk. I sat along side of her at another desk and was making notes from a book that I am reading. She saw that I was “doing school” and became much more interested in her own studies. She liked having me study right along side of her. Currently, I am working my way through a college textbook on writing as well as an online course. Since I am writing a book, I find it valuable to take the classes to better hone my skills. My husband is also taking online courses through a college. He is doing so while out on the truck. When parked in an area that has WiFi access, he is able to go to the college website and watch the lectures. You don’t have to be taking college courses. What about simply reading a good book on a topic of interest? Take a class at an art supply store or a cooking class. Many sewing centers have classes available to earn how to do basic sewing. What about learning how to repair any small appliances or a sewing machine? This helpful skill would be a great way to save money later on when you avoid repair bills through making the repairs yourself. The key is to let your chlidren see you reading and studying. Show them through example that you find education to be a very valuable resource. You may surprise yourself and find that the kids will develop a love of learning also. So, tonight, I changed both the email (to one that I check daily) and the password. And I have done what everyone says you should never do. I wrote them down. I am not good at remembering what password I use on which website. There are some things about technology that is really a pain in the keester. Well, at least now I can get back to posting again. I am really beginning to see a problem with writer’s block. I have limited computer time each day. Using a small solar power system that does not allow me to use the computer for long periods is a challenge, but not one that is insurmountable. My issue is more basic than that. I get writer’s block on a regular basis. Some days, it seems that the words simply flow. I am able to write up to 2 chapters at a time. Other nights, and somewhere between my walking over to the computer and my backside meeting the chair, the thoughts simply evaporate. I am beginning to truly believe the source of the block is that I am trying to write what I want and not letting the book write itself, so to speak On nights when I allow the words to simply flow from inside of me, the writing is so much easier to do. When I try to put my own interpretations in to what I see coming from the book, I seem to hit a snag and the flow simply falters to a stand still. It is time for me to let go and let the book take me where it will.